Hello everyone, sorry for no posts the last two days … last weekend was my bachelorette, and I felt like I was still recovering. So yesterday at the office my boss sent me to the website of his favorite architect, Steven Harris, who seemed familiar to me … that’s because his work has been featured in Elle Decor several times! However, below are two photos of a townhouse on Jane Street that tie into our conversation a couple weeks ago about modern additions to historic buildings. 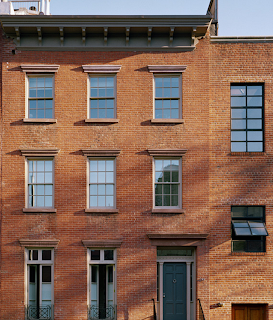 From the front, this Jane Street townhouse looks like many others on the block – beautiful 6 over 6 windows, french doors on the ground floor, and Greek Revival detailing. During the renovation, expert care was taken to restore the front of this house. On the back of the house, however, the architect took a different approach . He opened up the entire backside of this house to its little garden on Jane Street. What I love about this is that the aesthetic changes on the interior of the house do not impact the visitor experience on Jane Street, and yet the owners still get the location they wanted with the design style they love. Please go look at more of Steven Harris’ work, he is really brilliant. What a beautiful renovation. Thank you so much for sharing. I love the back of the house!! Just awesome!! Ps this your buddy Emily! 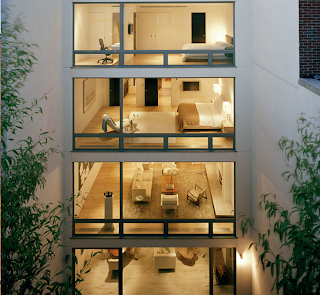 The proportions match beautifully, even though they are a different kind of window. Very sensitive and thoughtful work: the kind that takes the longest time, but then is a joy for so long once built.